London Country's LR-class Olympians only comprised 75 buses, bought over several years, but they have worn an astonishing number of liveries, and have lasted well in service in London's outer suburbia. 1982 saw London Country buy the first of its Olympians, making a break with a decade of buying Atlanteans. The first thirty, like all the others for London Country, were of the higher 14ft 2in option, with bodies built by Roe (a Leyland company in those days). Mechanics involved a Leyland TL11 engine. Livery was NBC green with a broad white band, white fleetname and coloured NN symbol. The first few went to St.Albans for use on the 84 (St.Albans - New Barnet Stn), which London Country had won on Hertfordshire tender. Others went to Leatherhead, Godstone and Reigate for the arduous North Downs routes. Their arrival allowed the transfer of early Atlanteans to the training fleet in place of the ex-London DMS Fleetlines. The fifteen delivered in 1983 (LR31-45) all went to Hatfield, after a period in store at Reigate while their routes were cleared of overhanging trees. From October they were used on routes 300 and 303, displacing long Nationals. LNBs were also the target for replacement in spring 1985, when a further fifteen were delivered. They went to Leatherhead (LR46-8, 50), Watford (LR49, 51-5) and Harlow (LR56-60). The next batch, in April 1985, were very similar, but with bodywork by ECW. The grilles for air-flow around the sidews and back were a little different, the upper deck washout holes were placed diffrently, and the trafficators on the sides were differently placed, but otherwise they were much the same as the Roe built products. Six (LR61-66) went to Hatfield, where four were allocated for the LRT-tendered 313 (Potters Bar - Chingford). LR67-68 went for Green Line service on the 799 (Stansted-Victoria) from Harlow, LR69-73 displaced SNBs from Garston, and LR74-5 went to Leatherhead, again displacing SNBs (which went to Lewisham for the P4). Livery was again NBC green with a white band. 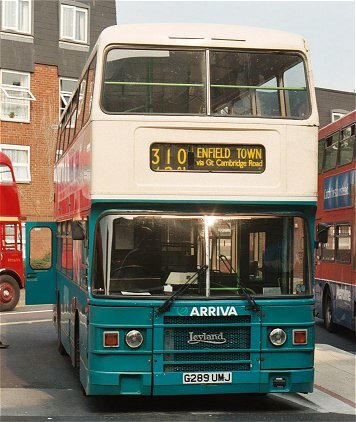 From the end of 1985 a new livery appeared, with a pale green band rather than white, and pale green fleetnames without an NBC symbol. The writing was on the wall for the National Bus Company. It was to be divided up and sold off in penny packets, in order to "encourage competition". Even London Country was deemed to be too large to be snapped up by enterprising individuals, so it was divided into four from September 1985. LR Olympians ended up in three of them - and the fourth area, soon rebranded Kentish Bus, soon acquired some of the type for itself. The other divisions found the Olympians useful buses for joining in the suburban bus battles. London Country South West, had a number of Olympians, used from Godstone, Reigate and Leatherhead mainly. The company was privatised in February 1988, and rebranded itself to London & Country in early 1993. This reflected tendered operations into the LRT area, which resulted in the establishment of their Croydon operating base at Beddington Farm. New livery settled on two shades of green with a red band - very smart. The London & Country Olympians were good vehicles for their tendered operations, and many were used on the London operations, and spent some time with the "Londonlinks" operation while it lasted. Arriva's collapsing of the area's operations in the mid nineties (not enough profit) saw the dispatch of the surviving Olympians to other parts of the empire, notably Arriva Fox County, Arriva Cymru, Stevensons, Arriva Midland Red North, and to City of Oxford Motor Services. London Country North East had Olympians at St.Albans, Harlow and Hatfield. It quickly adopted a new livery, a rather sombre affair with a dull green, a dark green and white relief. Again the Olympians were signicant on tendered work, notably the 313, where they worked alongside some rather ancient secondhand Atlanteans. The company was privatised to the AJS Group in April 1988. A strike over worsened working conditions led to the withdrawal of tendered operations, and a reduction in the bus fleet. The Olympians, relatively modern buses, survived the onslaught, and many moved to Hertford. London Country North East was then split (in January 1989) into two parts - County Bus and Sovereign. County Bus was bought by the Lynton Group in July 1991, then to West Midlands Travel in October 1994, followed by Cowie Group (subsequently Arriva) in February 1996. Arriva has since played pass the parcel with it, through a number of reorganisations. Through this the dozen Olympians settled on thev Lea Valley corridor, with branding to match. The first shot at a new livery was a pleasing cream with green skirt and bands. Arriva national livery even later in the nineties allowed their easy transfer into The Shires fleet. As early examples, some have been sold for scrap, while others soldier on in less arduous corners of the system. Sovereign was the western part of the old LCNE, based at Hatfield, St.Albans and Stevenage, and was bought by Blazefield Holdings in January 1989. Policy changes with bus operations in the area saw several of the LRs transferred to Keighley & District in Yorkshire, whence some have returned. Whilst operations were mainly based in Hertfordshire the Olympians acquired a cream livery with Cambridge blue skirt and lining, with Hertsrider fleetnames. Stevenage operations, with some of the Olympians, were sold to Luton & District in May 1990. When Sovereign expanded into the Harrow area, and also worked Cambridge Coach Services from Huntingdon, the livery was amended, with a black waist stripe and Sovereign fleetnames. In 1994 some LRs were transferred into the Borehamwood operation and received poppy red and yellow livery. By 2002 the surviving Olympians were at Edgware or Huntingdon. London Country North West had a decent share of the Olympians, primarily for Watford Area services based on Garston. LCNW retained the London Country fleetname onto its new livery, with a north-west pointing triangle incorporating "North-West" wording. The new livery was dark green with silver-grey - with more silver at the front and more green at the back. LCNW bought another fifteen LRs late in 1989. LR76-90 were again basically similar, but this time the bodies were by Leyland, with detail differences again. They were wanted for operation on the 142 (Watford Junction - Brent Cross). During delivery the company was taken over by Luton & District. They bought another dozen (LR91-102) early in 1991 for the 340 (Edgware Stn - Harrow). Luton & District went on to buy further Olympians, either secondhand, or new with Alexander bodies, which are on the next page. Luton & District was in turn taken over by British Bus in July 1994. A major rebranding started in April 1995, with a new livery of blue and yellow with stone skirts, and local fleetnames in white/orange. The overall trading name was "The Shires", but this did not appear on the buses. British Bus passed to the Cowie Group in June 1996, who rebranded their operations nationwide in November 1997 as Arriva. A national livery of turquoise with cream scoops at the front was introduced, and the Olympians gradually succumbed to this. As they aged the Olympians have been gradually sidelined to less arduous duties, which has seen more moving about from their original haunts. 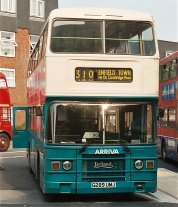 Some of the Watford buses that spent their working lives on the 142 for LRT moved across to Ware late in 2002 to perform similar duties on the 310 between Hertford and Enfield, before being displaced by ex-London L-class Olympians. The older examples have been disappearing from stock, to the scrapyards or to other operators. 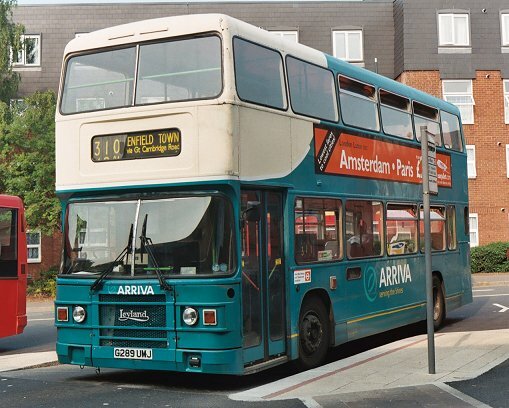 LR 89, now 5119, moved from its perennial haunts around Watford to Hertfordshire, working between Enfield and Hertford on the 310 trunk route replacing elderly Metrobuses at Ware. It was seen at Hertford in June 2003.It has probably now been displaced by an ex-London L.